I think there are now one hundred days until the General Election (I haven't bothered to count, but that's what people on Twitter are saying – and they're never wrong! ), but most of the talk so far has been about the damned televised leaders' debates. The leaders' debates were a new innovation for the 2010 General Election – I have already explained why they were a bad idea then, and are still a bad idea now. But the more I hear of the debates, the more convinced I become that they not only add nothing to the election campaign, but are detrimental to democracy in general. […] this clunky, unnecessary, counter-productive political device […] has been imported from America and shoehorned into our vastly different political system with practically no alterations. The televised leaders' debates serve to make our electoral system seem more presidential, and in doing so, diminish the link between local MPs and their constituents. They oversimplify politics in a way which doesn't serve the country at all. It's time to admit that they were a mistake in 2010, and we'll be better off without them in 2015. However, when I wrote in October, the debates were in the spotlight over the issue of whether UKIP should be included. By now, however, we have moved way past that – with UKIP's participation in the debates now seemingly a given, the latest wrangling is about whether the Green Party should also be involved, along with the nationalist parties of Plaid Cymru and the SNP. A seven-way debate, of course, is not impossible. But whether it's possible should not be the question we are asking here – rather, we should ask 'is it desirable?' There are several reasons why I believe it is not. Firstly, the simple fact of the inclusion of parties who don't put up candidates across the whole of the UK – and who, therefore, necessarily only speak to a portion of the electorate – is problematic. As the broadcasters reach out to the SNP and Plaid Cymru, Northern Irish parties such as the DUP are now wondering aloud why they are not also being invited to join the debates; if the DUP (who, let's not forget, currently have more seats in the House Of Commons than either Plaid Cymru or the SNP) were invited, we would end up with a debate between eight party leaders. These debates are supposed to help voters decide how to cast their votes – how does presenting them with options at least 25% of which they couldn't possibly vote for even if they wanted to do that? Secondly, even leaving that issue aside, I don't see how the televised debates are meant to help an undecided voter make up his or her mind. In 2010, the analysis of each leader's performance in the debates seemed to focus much more on 'body language', what colour tie each leader was wearing – and, afterwards, who had 'won' – than on the actual content of each argument. The whole process struck me as horribly superficial. With seven, or even eight, people involved instead of three, that rigmarole will be intensified further, with pundits and public discussing who stood where, who wore what, and who 'won' instead of – y'know – actual politics. That's not the way to build a thriving democratic process. My final objection is closely related to the last one, because even before the debates have begun people are not talking about politics and policies – they are talking about the debates. They are talking about who should, or should not, be invited to the debates; what the format of the debates should be; when they should take place; whether broadcasters should 'empty chair' any leader who declines to take part… Are these the issues on which we should be focussing, with only a hundred days left before we have to decide who will be running our country for the next five years? The more we allow the ins-and-outs of the debates to dominate the discourse leading up the election, the more we allow the superficiality of politics to take over, and the less we as voters can connect with the issues which really matter. That is not democracy, and that is why we need to consign the televised leaders' debates to the history books. Why can't we talk about the NHS? It is with not inconsiderable trepidation that I sit down now to write a Blog post about the National Health Service. It can be a pretty touchy subject. Unfortunately, this is a big part of the problem. Although I feel pretty positive towards the NHS in general, I find that few things irritate me more in the realm of political discourse than the apparent beatification of the Health Service, and the way in which so many people are seemingly so incapable of discussing health policy rationally. The NHS is a good institution – but that doesn't mean there is no conceivable way in which it could be improved. Even a statement as benign and self-evident as that one, however, is tantamount to high treason in some people's eyes; even to hint that the NHS is anything less than a million percent perfect is proof positive that one is an enemy of health, of the state, of civilisation itself. And remember, it's not just 'the NHS' – it is your NHS; our NHS; THE PEOPLE'S NHS. It is the envy of the world. In a recent survey event all about the NHS by the pollster Lord Ashcroft, the NHS was described by one respondent as 'the soul of the country'. This is not a healthy state of affairs. The amount of ludicrously emotive, hyperbolic rhetoric surrounding the Health Service – along with the idea that it should somehow be above scrutiny, and above reproach – makes it impossible to have a rational, objective discussion about the challenges (and there are challenges) facing the NHS today. This was particularly brought home to me while reading Lord Ashcroft's Report from his NHS polling; I have long felt baffled and confused by health campaigners telling us that the NHS is constantly 'in crisis' or in need of 'saving', and yet opposing any and all attempts to improve or reform it – Lord Ashcroft's meticulous research, however, shows up a far greater number of paradoxes in the way people view one of our most important public services. Ashcroft found, for example, that consistency of care (as opposed to the dreaded 'postcode lottery'!) was an important issue, with 72% of people asked saying it was important to make sure healthcare varied less from one hospital to another, or between different areas of the country (and as many as 60% thought the government should 'set standards and targets that all hospitals must meet'). At the same time, however, more than half the people in the survey (57%) supported the idea of decisions being taken 'at a more local level' to 'ensure the needs of each particular area are met'. Another strange dichotomy which struck me was that although people were not overly bothered by where they got treated, provided the quality of care was good, or by being able to choose which hospital they were sent to (which is a blow for the recent drive to introduce more 'choice' and 'convenience' into the health market), they still opposed the closure of local services. Only 35% of people placed a great importance on 'being treated near your home', when asked what aspects of the Health Service they thought were most important, while 79% described 'high quality of medical care' as 'very important' – and yet, despite placing relatively little value on being treated close to home, when asked what the government should consider to help fund the NHS in future only 36% of people said the they should consider 'closing some local hospitals to consolidate services into bigger, more efficient units with expert staff'. Ashcroft's survey also uncovered a remarkably entrenched view from many of his respondents. 21% of people say they would oppose the use of private companies to deliver NHS service, even if this would mean a better standard of care. This stubborn view that 'private' is axiomatically bad – even when the results are positive – and needs to be warded off with a shaman's stick is the determined dogmatism of blinkered ideologues. That's not to say that more private sector involvement is the answer to issues with the NHS – there is a distinct possibly that it isn't – but to dismiss the idea out-of-hand, refusing even to consider the benefits such an option might bring and weigh them up against any possible negatives before making an informed judgement, is supremely foolish. The NHS is a public service, paid for out of tax money – and, as such, the public deserve to get the best possible service for their money. We don't get emotionally attached to other public services like London buses or councils' bin collections, and feel a great need to defend their honour as we would our own children whenever anybody casts aspersions upon them. In politics, everything should be up for discussion. How else do we improve things? If the NHS can be improved – if healthcare in general can be improved – that is unquestionably a good thing, and something we should welcome. We need to consider all options, and debate the pros and the cons without getting hysterical; without thinking that those who disagree with us are evil bloodsucking vampires who want to roast babies like marshmallows and eat them squeezed between digestive biscuits, instead of simply being people offering a different solution to challenges which affect us all – a solution which we may not have considered ourselves; and without placing a higher value on the concept of a National Health Service (in its current guise) than on people's health and people's lives. This Conservative campaign poster for the upcoming General Election is already under fire. Why? Because, as correctly predicted by my brother, the road in the picture is, in fact, not in Britain at all – but is in Germany, outside Weimar. Who cares?! I can't, for the life of me, think why this matters. Of all the things to get worked up about, is this really the one you would pick? It's a stock photo of a road, and it could be anywhere in the world – adverts use stock photos. There isn't really a 'road to recovery' which you can actually drive down at all; it's a metaphor. The manufactured outrage surrounding this is ludicrous. 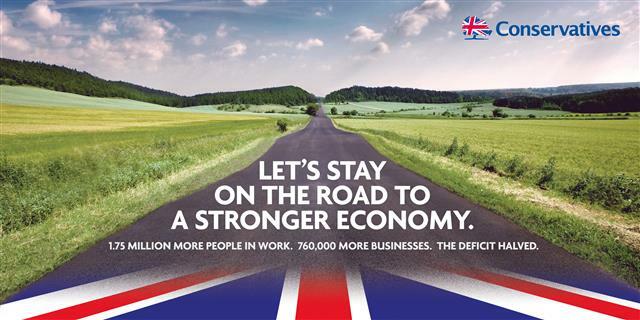 What we should be looking at is the claims which the Conservative Party makes on its campaign poster. One of the boasts they make on 'the road to recovery' is that 'the deficit is halved'. Is it? Fraser Nelson described in the Spectator last month why this may not be strictly accurate – and yet people are more interested in foaming at the mouth about the location of the photograph being used in the campaign! Isn't this akin to seeing a company's advert on television and being more angry about the fact they used actors in the advert than about the possibility they may be making false claims about their product? In politics, facts matter. Stock images don't. The next few months are going to get pretty ridiculous if the criticisms levelled at this Conservative 'road to recovery' poster are indicative of the level of discourse we can expect from the General Election campaign. Let's stop worrying about these trivialities and instead subject all parties' claims and policies to the kind of proper scrutiny required to make an informed choice about who to vote for in May.